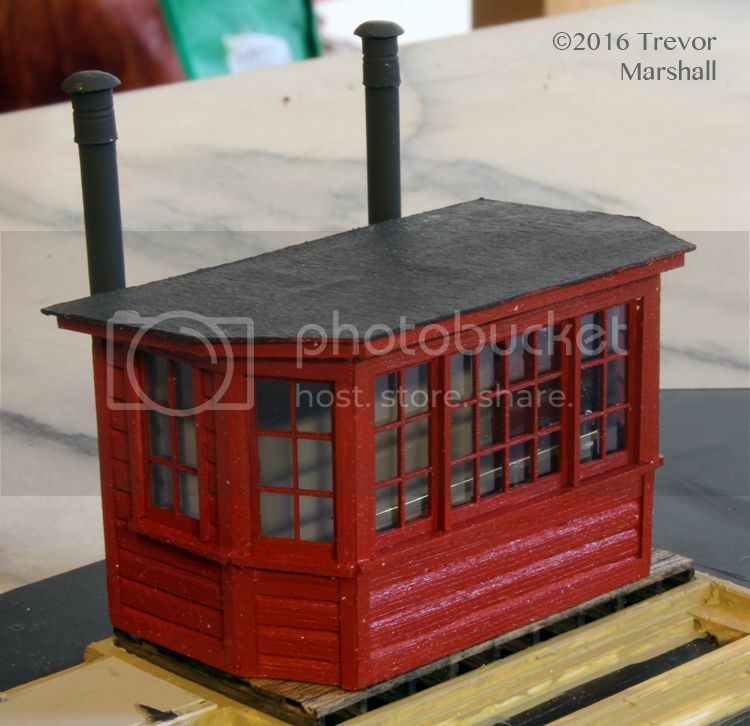 I’m a member of this group of modellers, who have built a Free-mo style modular layout in 1:64. 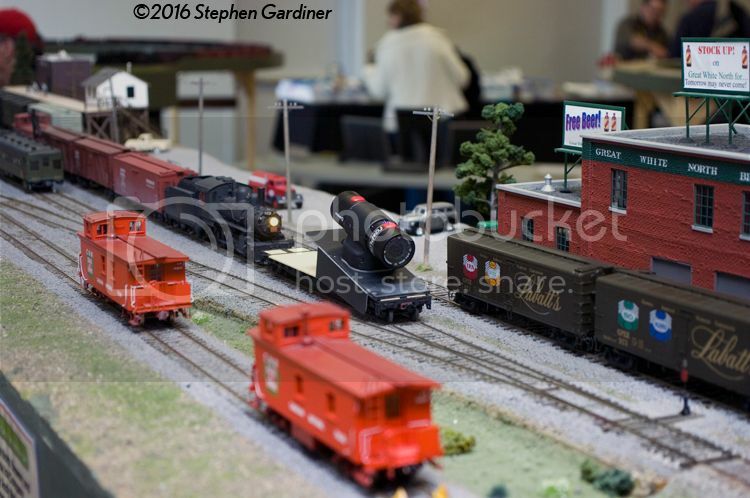 I had a great time attending the 2016 Brampton (Ontario) Model Railway Show this past weekend, as part of The S Scale Workshop exhibit. As noted on the Workshop’s blog, we displayed a large U-shaped point-to-point layout, with short train-length turntables at each end. This was our first appearance at the Brampton Model Railway Show and the organizers did a great job. Set-up was well-organized on Saturday morning, and it’s nice to be able to drive right into the building to unload – particularly this year, when a light rain fell for much of the weekend. The organizers also provided exhibitors with free coffee and donuts in the morning (because Canadians run on donuts) plus coupons worth $5 off at the barbecue (hotdogs, sausage on a bun, chips, pop, etc.) that they’d set up outside, which was a nice “thank you for coming” – and much appreciated! The S Scale Workshop’s Free-mo style modular layout ran well for the most part. We had a few alignment issues between modules on Saturday, but by the early afternoon we had basically solved those problems. I contributed my two broad curve modules, which made their first appearance at in the Greater Toronto Area. Also a first, we split the curves and put another module in between them. That worked really well. It’s nice to know my curve modules give the group some additional flexibility. In addition to the modules, I brought out a variety of motive power – including CNR 2-6-0 908, my Model 40 Burro Crane, my gas-electric, and CNR 2-10-2 4204. With no return loops, the 4204 was a monster on the layout: It was really out of place, given that we were limited to four-foot-long trains. The Mogul was a much better choice. This show was the first time I’d exhibited modules with fellow Workshop members John Johnson and Jim Martin. The fourth member to contribute modules to last weekend’s layout was Andy Malette. He has been at almost every show, including the two shows I’ve done in the Montreal area. I know Jim and Andy quite well, but haven’t had many opportunities to “play trains” with John – and I’m really glad we had the chance. This has turned into the largest annual show in the area, and we’ll definitely be back (although we tend to not do every show every year, because we only do a few shows per year and want to spread around our appearances). All-in-all, a grand weekend out! And it was great to meet a number of you at the show – thanks for stopping by! Bored? Looking to watch some train videos? Why not check out the S Scale Workshop blog? 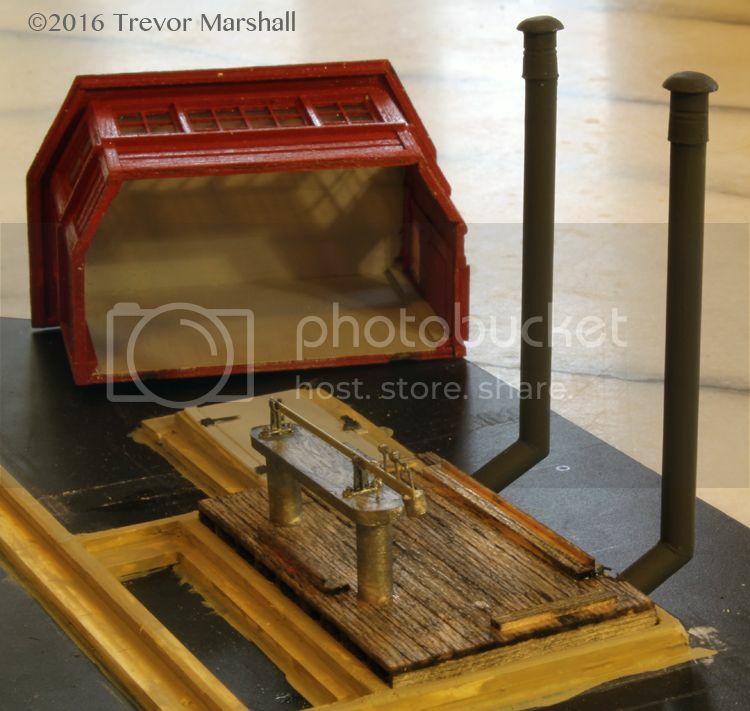 I’ve just posted four videos from the Workshop’s appearance in August at the annual model train show hosted by Exporail – Canada’s national railway museum. All were shot using my RePlay XD video camera, mounted on a flat car. Click on the camera car in the image, below, to visit the Workshop’s blog – and enjoy if you watch! See you at the 2016 Brampton show! I’ll be joining my friends in the S Scale Workshop at the Brampton Model Railway Show, October 1-2. There’s more information about this exhibition on the S Scale Workshop blog – including a diagram of our planned layout. I joined several of my friends in the S Scale Workshop this past weekend, to exhibit our free-mo style modular layout at Exporail – Canada’s national railway museum. I’ve added a full report – with lots of photos – to the S Scale Workshop blog. Click on either photo, below, to visit that blog and read the report. Enjoy if you visit! I’m still setting up my new workshop, but I’ve already had a chance to put it to good use as I prep my S Scale Workshop modules for an upcoming appearance. I thought I’d share this photo because it illustrates how I plan to work in the new space. The central work table – a Festool MFT-3 – is at a good height for working, and allows me to get around all four sides of a larger project like this. For now, I’ve covered the MFT-3 in cardboard to protect the surface from glue – but I’m planning to build a proper, removable cover. Meantime, the cabinets at the back provide a handy place to hold all the tools and materials I need. In this case, I’m punching up the scenery on my Workshop modules so I have my static grass applicator, static grass and other tools and materials laid out. This is also a good opportunity to remind you that I’ll be joining my friends in the S Scale Workshop at Exporail: The Canadian Railway Museum on August 20-21 for the museum’s annual celebration of model trains. The Workshop exhibited at the museum for the first time last year, and it was very well received. Click on the image, below, to see photos and videos from last year’s exhibit, and I hope to see some of you at Exporail in a couple of weeks! Brian has made tremendous progress on an S scale, modular switching layout, designed to fit over top of his HO layout in a spare room. The rest of the story can be found on the S Scale Workshop blog. Enjoy if you visit! Hopefully, we’ll see you at one of these shows! I’m always on the lookout for new ways to view my hobby, and to capture and share the effort with others. I’ve taken a lot of photos of my layout – and even some video – using a variety of image capturing hardware. Now, thanks to a conversation with my friend David Clubine, I’m able to capture the view from the cab in video, too. As the members of the S Scale Workshop prepared to exhibit their Free-mo style modular layout at this year’s Copetown Train Show, we were looking for a way to share our effort with a wider audience. Someone had suggested we should some trackside video and I thought that would be a novel way to see the layout. But what to use? One of our members suggested an iCar – a laser-cut car that holds an iPhone and allows one to aim the camera down the track. But they’re not available in 1:64, and I was looking for something that would shoot better quality video. A GoPro was also considered – but while they’re small as cameras go, they can be quite large. Then David suggested the cameras made by Replay XD. David runs a company that serves and supports professional racing teams, and he uses the Replay XD to capture high definition video of the cars in action. It’s small yet rugged, and its “lipstick” shape doesn’t compromise a race car’s aerodynamics. While we don’t need to worry about drag coefficients in the railway modelling hobby, I realized the small size of this camera might be just the ticket for mounting on a flat car to capture video from the engineer’s perspective. So I ordered one from the California-based company. At just over 1″ in diameter and under 4″ long, the Replay XD Prime X is smaller than a GoPro, and weighs just 3.5 ounces. But this small camera packs big performance – capturing high definition video and audio, and it’s WiFi enabled so it can be controlled from a smart phone with the Replay XD app. One can start and stop recording, and the camera will stream what it sees. Pretty slick. The camera arrived Friday and I got to work building a suitable mount so I could secure it to the deck of an S Helper Service flat car. (These are great candidates for this as they’re all metal: their weight means they track well and glide smoothly on the rails.) At first, I mounted the camera mount on a piece of 0.060″ thick sheet styrene. I marked out and drilled four holes in the corners, arranged to line up with stake pockets on the flat car, and glued short lengths of .025″ phosphor bronze wire into the holes. This worked well: the camera was easy to mount on the flat car, it stayed put, and I didn’t have to modify the car in any way. I did some testing on my layout but I found that the camera – equipped with a wide-angle lens – captured too much of the ceiling in the layout room. So I went back to the workbench and built a wedge – like the front of a snow plow – so that I could mount the camera pointing down at the track. This worked much better, and is the version shown in the photos of the camera car at work on the S Scale Workshop modular layout. 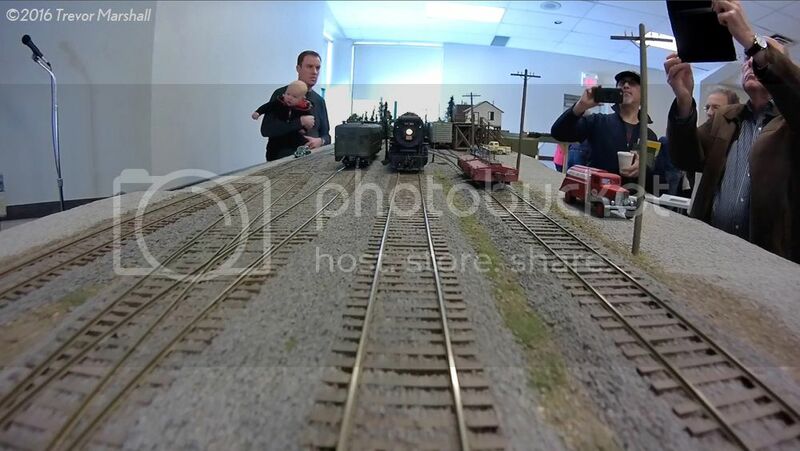 I took the camera car to the Copetown Train Show on Sunday and shot several minutes of high-quality video. The camera and app are easy to use and I’m very pleased with the results. I’ve posted two videos shot with the Replay XD to the S Scale Workshop blog. Click on each of the photos, below, to visit the Workshop’s blog and watch the videos. I hope you enjoy them. A decade ago – in February of 2006, to be exact – I visited the Copetown Train Show and saw the modules built by the S Scale Workshop. I was working in another scale and gauge at the time, but a seed was planted that today has resulted in the layout featured on this blog. 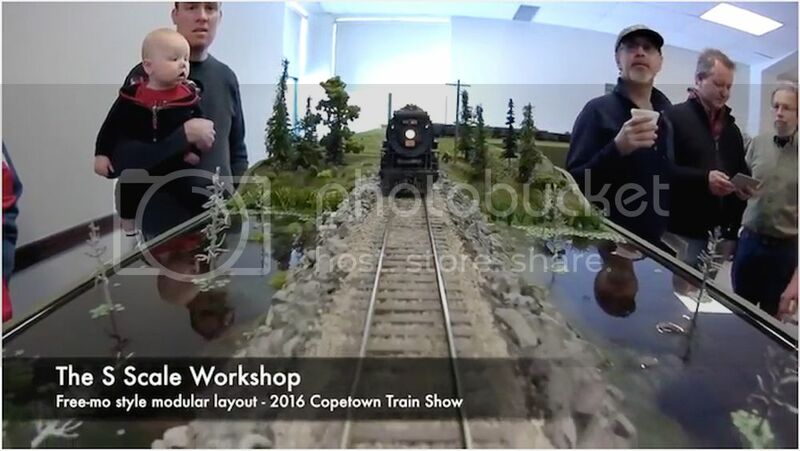 It was the Workshop’s first exhibition of their free-mo style modular layout and it impressed a lot of visitors at Copetown that year. 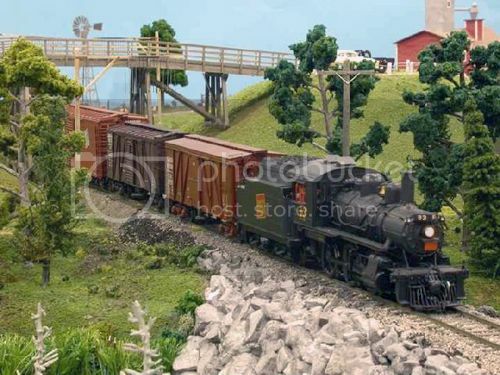 I headed home and wrote a letter to Bill Schaumburg – then editor of Railroad Model Craftsman magazine – about the show, and the debut of the S Scale Workshop on the southern Ontario exhibition scene. Greetings from the Great White North! Although I must admit it’s not really white in Southern Ontario these days, despite it being the middle of winter. It’s cold, but the ground is brown and the roads are dry, which makes for easy driving (always a concern at this time of year). But even if the weather outside IS frightful, many enthusiasts (myself included) brave the elements at the end of February and hit the road to the Copetown Train Show, which takes place in a small town of the same name just west of Hamilton, Ontario. Copetown has never been a typical train show, but rather a showcase for fine model building with a focus on Canadian prototypes. Copetown features photo dealers, Canadian railway SIGs and Historical Societies, booths about area club layouts, tables staffed by manufacturers of Canadian-prototype rolling stock, structures or other details, authors or dealers of books about Canadian railroads, and layouts that exhibit a high degree of craftsmanship, usually based on a Canadian prototype. There were a number of layouts on display this year, but I think it’s safe to say that the one that created the biggest buzz in the hall was a modular layout created by seven members of the S Scale Workshop. This layout is built to the Workshop’s own version of the Free-mo standard, which allows groups to build modules of any size and shape and then link them together in any number of ways to create large free-form layouts (the concept is described in detail at www.free-mo.org). The members of the S Scale Workshop began building their modules in earnest just a few months before the show, yet managed to assemble an astonishing 93 linear feet of model railroad in a large, lazy U-shape that worked its way through the main exhibition space. The modules assembled into a single track line with a staging yard at one end, a model of Port Dover, Ontario at the other (actually, part of one member’s home layout), and a passing siding in the middle, with a couple of spurs still to be built. Using wireless walk-around DCC throttles and a small fleet of sound-equipped S scale Canadian National 2-6-0s built from etched kits by S Scale Loco and Supply (www.sscaleloco.com), the layout kept visitors entertained all day. Some of the modules were unfinished at show time – one was still at the pink Terra Foama stage, while another had nothing more than green garbage bags stapled to each side of the roadbed to prevent any derailed trains from making a 50-inch plunge to the floor – but the potential was readily apparent and I’m sure this group will impress us all over again the next time they do a show. It was particularly enlightening to see an S scale, craftsman-quality layout up close and personal. Interesting things are happening in 1:64, and it’s worth looking into (as if I need ANOTHER distraction). I can understand the attraction, especially if one’s modeling subject is a modest prototype, such as a branch line patrolled by small engines pulling light trains of 40’ steam-era cars: The “slightly larger than HO” nature of S would give small prototypes a presence and heft that HO just can’t accomplish, without having the overall scene overwhelm a layout room. It was also interesting to watch the crowd’s reaction to both S scale and the free-mo nature of the layout. One could almost see the current hit the mental light bulbs. 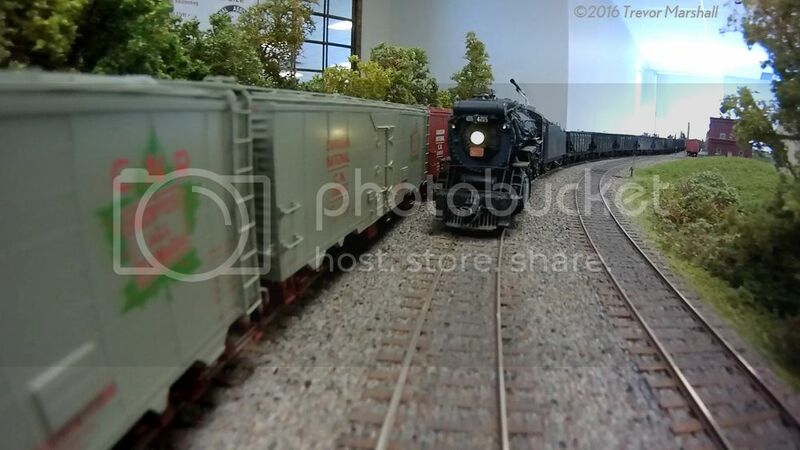 I predict that in the next couple of years, I’ll be seeing many more Free-mo style layouts at Southern Ontario shows – mostly in HO, of course, but in other scales too. While most of the Copetown attendees have invested serious amounts of time and money into their chosen scale/gauge/era/theme, building a Free-mo style module would give many of them an opportunity to explore an avenue of the hobby that lies beyond their primary interest, and who knows where that could lead? Only to great things, I expect. The builders of the HO scale Ontario & Eastern sectional layout (which was the cover story in the February, 1998 RMC) started the show several years ago. After a long and successful run, the O&E members decided to retire their exhibition layout to devote more time to their endeavors at home, and they passed the show’s organizational duties onto the Canadian Association of Railway Modellers (with a double “L”, since that’s how we do things here in Canada). So, Bill, that’s the story. I hope you can make it to Copetown some year – weather permitting, of course. But to be fair, I should warn you that by the end of the weekend you may end up horse-trading your Nevada County Narrow Gauge equipment for some CN moguls, eight hatch reefers, and other signature models of Canadian railway history. I was an outsider to S scale when I wrote that, but I find it interesting that my initial reactions to the scale were, by and large, right on the money for me. It turns out I did. I was unhappy with what I was doing in the hobby, and it was time for a change. It took me about five more years to realize that. 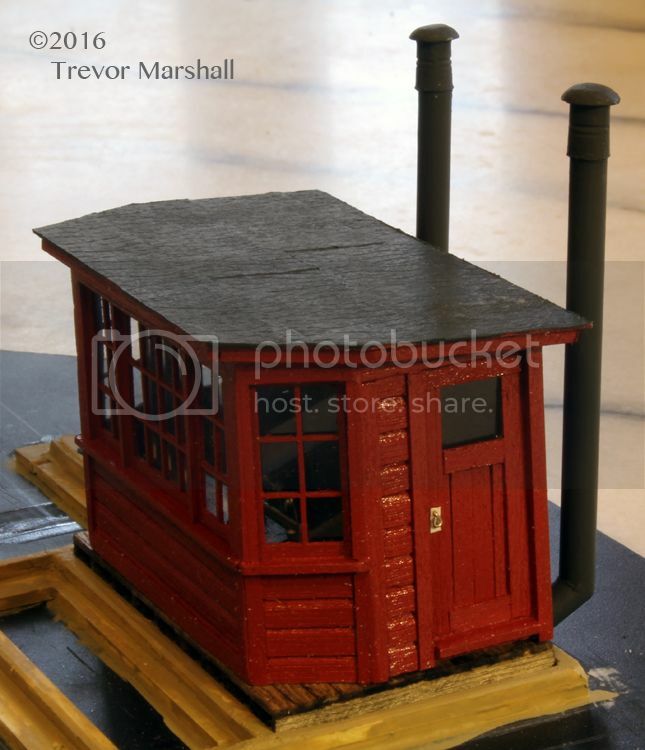 Well, that’s pretty obvious, since that’s what I’ve ended up modelling on my Port Rowan layout. This is definitely something that I’ve appreciated as I’ve been working in 1:64 over the past few years. I’m a junkie for detail, and as I wrote way back near the beginning of this blog, I originally tried to design an O scale layout to fit my space. It didn’t. S did, while still giving me most of the presence that I love about O. It’s not “in your face”, but it’s also not “way over there” either. This has also happened. Since 2006, several Free-mo groups have launched in the region. I’ve even been involved in a few of them. Some have folded, others have remained quite small, but there are also some quite large groups that are very active. I’m glad I read the crowd right that day. This is still the case, 10 years later – and it’s one of the reasons that Copetown continues to be a terrific show for the “serious” hobbyist. As a show, though, it remains a novel experience in Southern Ontario – an exhibition with a specific focus, instead of a general train show. Other good examples of “focussed events” in the area include the Ontario Narrow Gauge Show and the Great British Train Show, organized by The Platelayers Society. Both are well worth attending – in large part because of their unique focus on the hobby. There are several local shows each year that pretty much present the same thing as every other local show. The same layouts are featured. The same vendors show up. If you’ve seen one, you’ve seen them all – so there’s not much point in attending. Some of these local shows are failing. If they want to turn around their fortunes, they could look at how to make their shows a unique event instead of offering up more of the same. 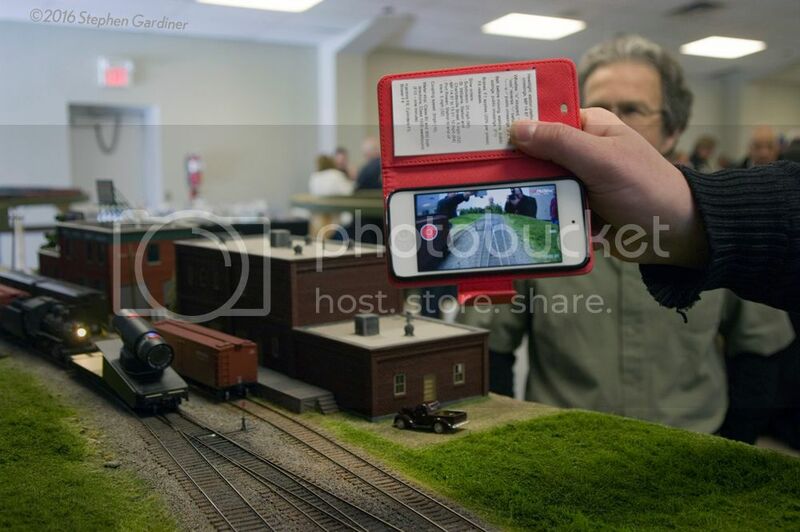 It’s been 10 years since I wrote that piece, and The Copetown Train Show continues. 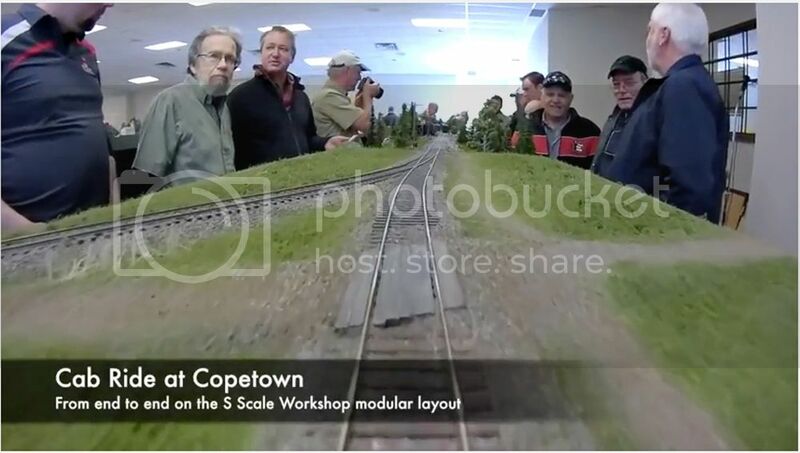 So does the S Scale Workshop – which will be celebrating the 10th anniversary since it first exhibited those Free-mo style modules, as it exhibits at the 2016 Copetown Train Show. Workshop member Jim Martin has written about this on The S Scale Workshop blog. We’ve included a couple of early photos from 2006, as well as a layout plan for this year’s exhibit and information about attending the show. Check it out, and I hope to see you in Copetown on Sunday, March 6th!